One of my duties at the Lostpedia wiki is to keep an eye on the list of recent changes made in the encyclopedia by all editors. Sometimes this means congratulating hard working editors, or standardizing style-- and once in a while it means correcting vandalism. Sometimes though, I honestly can't tell if a contribution is outright vandalism or not, and today was such a day, and the result of figuring it all out ended up being a really fun revelation. A new user posted edits to the "Background cast" page, specifically the section on whom we like to call "The Other Others", who are not as well known among Lost fans as are the background Flight 815 survivors. The editor added two names, and two photos, for BG Other #1 and #29. The entry for BG Other #1 was edited with a ridiculous headshot, and a name I could not corroborate in Google; it was possibly vandalism. However the second name, which the editor had penciled in as Thomas Hannsz for BG Other #29 (right, standing in front of Locke), scored plenty of hits in Google. Most results were art poster websites, which seemed random, and I still didn't see any headshots or photos of the actual person to compare to Lost. But when I looked up the name at MySpace, there was a surprise. There was indeed a page for Thomas Hannsz. First of all, there was a headshot photo, and it reasonably matched the face seen in Lost as BG Other #29. 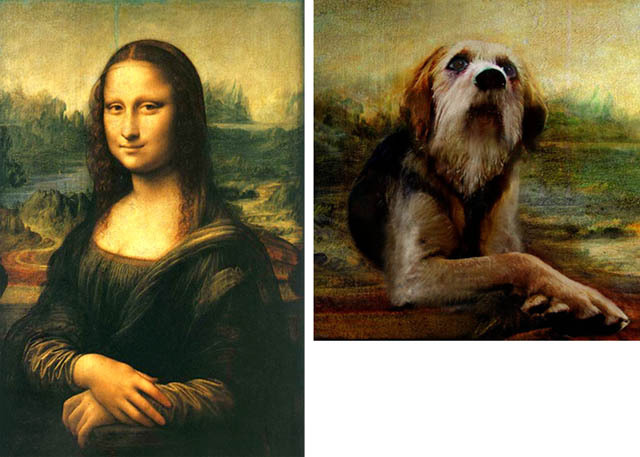 Second, according to the MySpace page, Thomas is apparently the real life painter who painted the prop of the dog painting in Jacob's cabin as encountered by Locke in episode 3x20 (left). 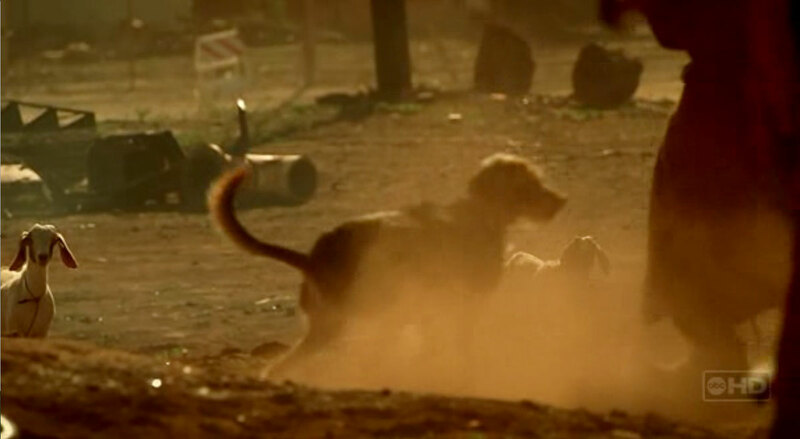 We previously had a tip that Jacob's painting was of Lost executive producer Jack Bender's personal dog "Lulu" (short for Ms. Honolulu), who you can see scampering around Nigeria (in 3x05, right) and on the Island in a promotional still (for 3x13, here). Finding the original painting now was an unexpected bonus. Thomas Hannsz's MySpace page further had links to: 1) an almost identical page of Jason Hannsz (so is it Thomas or is it Jason?) and 2) a page for the painting of Jacob's dog. 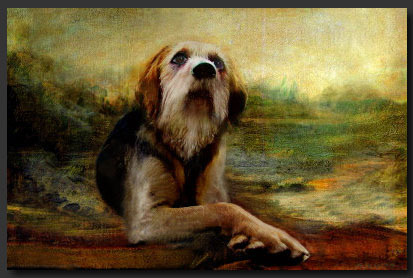 The MySpace page for the dog painting furthermore had a link to a page hosted at Artist Rising, where you can buy prints for about twelve bucks as well as the original painting for a cool fifty grand. Therefore apparently ABC did not purchase the rights to the painting, since the artist himself is able to offer it for sale, so Lost fans everywhere can treat themselves (or a lucky loved one) to a unique holiday gift for a very reasonable price. 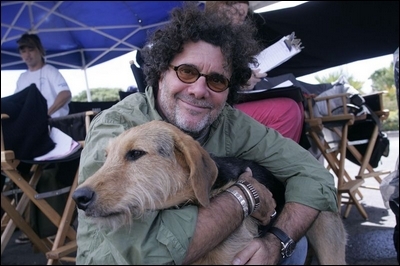 According to the editor's comments, Thomas was Lulu's personal caretaker when Jack Bender was away or on set. At any rate it really is a treat to be able to see Jacob's painting in its full original glory. Better yet, he's one of the Others. See the full size painting and buy prints at Artist Rising here. 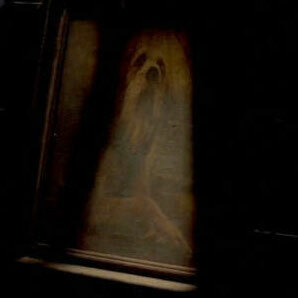 A comment below noted that the painting is a parody of Leonardo Da Vinci's Mona Lisa, and I'm inclined to agree. The color scheme, and washed out oil paint look are similar, but it is the iconic crossed hands that does it for me, as well as some of the shapes and colors in the background. The tree line has some exactly matching details, and the general color scheme is in parallel, although some details like the bluish water are horizontally flipped. Click the comparison image for a larger version.